Outdoor lighting fixtures are installed simply because they're needed for safety and security. Sure, that's plain practicality. But what if such need can be a creative outlet, too? That's possible with various techniques used to create drama in your yard at night. After all, the presence and absence of light affect the scene in your landscape. Spotlighting. This technique is telling in a subtle way which part of a landscape the eyes should look at. It can be that magnificent statue or that well-crafted mural. Silhouetting. Show off the shape of that lovely topiary with this technique. It uses a shadow so creatively that even if a subject has a bad texture, its beautiful figure will still stand out. Shadowing. This aims to create bigger shadows of trees with interesting branches and other elements with unusual shapes. Plus it adds security because a light for this has to be flooded. Grazing. Got great masonry elements? Show them off with our grazing technique. The installed outdoor lighting fixtures are pointing upwards at 90 degrees. Moon Lighting. As the name implies, this method copies the same lighting effect that moon can give over trees. Tree Lighting. This is somewhat the exact opposite of moon lighting where light points upwards, focusing on a tree itself and highlighting what it has to show off. Path Lighting. This technique will be perfect for enhancing the looks of walkways and for added safety in the areas. Spread Lighting. This is a low-level lighting technique that aims to spread a light evenly over shrubs and flowers. Step and Deck Lighting. 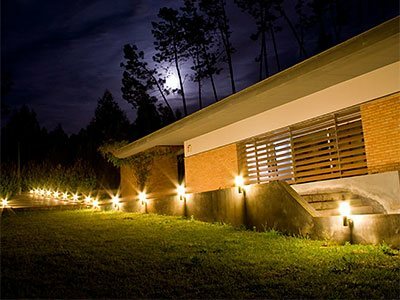 This is similar to path lighting, only that the lights are used for a step and deck. These techniques are specially made for every structure and element in a landscape. 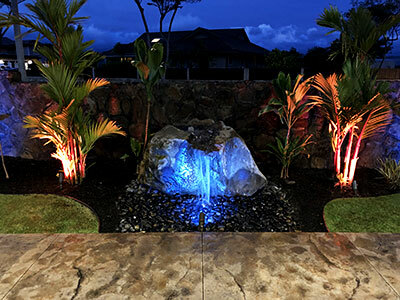 We combine them carefully to get a magnificent outdoor lighting show in your backyard at night. What's the sense of beautiful glow if your utility bills will be piling up because of higher consumption of electricity? And what good will outdoor lighting bring if a wire is waiting to cause an accident? With Unlimited Landscape Hawaii, we make sure that none of these will happen. We believe that enjoying a glorious glow at night in a landscape should never compromise finances or safety. Our team uses energy-saving alternatives like LED flood lights and solar lights for gardens. The LED lights emit enough brightness at a fraction of cost compared to traditional light bulbs. Meanwhile, solar lights are independent from the typical power source as these use renewable energy from the sun. Even better, such lights save energy during the day and then use it at night. These types of lighting fixtures normally include an automated system, so you won't have to switch them on or off. Whether you want to use the traditional or the contemporary options, you can rely on our expertise. Our team can design, install, and maintain your outdoor lighting. Tell us what you want to achieve in your landscape, and we will take care of the rest. We primarily serve Wahiawa, but we can also cater to clients from other Hawaii areas. Call us now.